An opportunity for high performing teams and progressive leaders to learn from horses. Take your team out of the office and into the world of horses for a safe, guided, hands-on team building experience. In partnership with equine master facilitators, horses enable team members to learn about each other and how to best work together. Activities are prepared in advance based on the training needs of your team. Interactions between the participants and horses are designed to simulate the types of interpersonal situations found at your workplace. The goal of each activity is to work as a team to guide horses through a challenging predicament. As the participants interact with the horses (and each other), challenges and solutions emerge which are discussed in facilitated debrief sessions. With each successive activity, team members naturally organize themselves around their collective strengths. They will be amazed as they achieve levels of success not attainable by individuals acting alone. All workshops begin with an overview of safety guidelines, horse communication basics, equipment use, and an introduction to the sequence and structure of activities. Each activity is approximately 30 minutes long followed by a debrief session. A typical one-day workshop includes three to four activities with rest breaks and a lunch break. Watch the staff from Carlisle Academy as they work through the “Leadership in a Box” activity. Observe their use of body language and nonverbal communication as they move horses into a “box” of ground poles. This is one of the challenges teams undertake in a one-day teambuilding event. 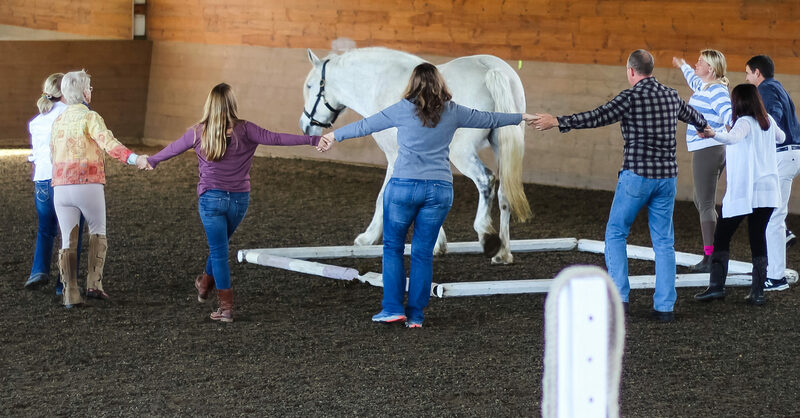 We will work with your organization’s training and development professionals to create equine-based, hands-on learning components for existing training programs in the areas of team collaboration, leadership, and interpersonal skills. Our instructional design specialists can create a one-day workshop or a full curriculum tailored to your organization’s needs. All workshops focus on the human/horse interaction and not on acquiring or practicing horsemanship skills. There is no horseback riding in the workshops. All activities are conducted on the ground. Horses are masters of communication and leadership – essential qualities of great teams. Interaction between horses and humans simulates workplace dynamics, providing a unique opportunity to develop Interpersonal skills beyond traditional classroom training.